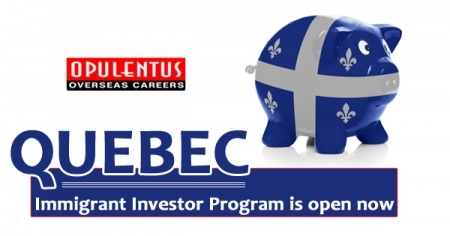 The Quebec Immigrant Investor Program is now open to accepting 1,900 fresh applications totally. Its new period of intake will be until March 15th, 2019. Also there is an allocation of 1,235 applications for China, which includes Macau and Hong Kong. Its unique feature is that, it is the only Provincial Stream which permits applicants, to get PR status by making a passive investment. The candidates must only make an investment in the province for five years. With effect from August 2, there is a revision in the eligibility criteria of the program. The changes are in relation to the net asset requirement of CAD $2 million, and investment requirement of CAD $1.2 million. In the past, these were CAD $1.6 million, for net assets and an investment of $800,000. The norm for investment is the tenure of five years with a subsidiary of Investissement Quebec. Moreover, the Investment Agreement should be made, through a financial intermediary, which has the authorization to participate in the Q.I.I.P. The investment amount, of $1.2 million, has the guarantee of the Provincial government, and it will be returned fully after completing five years. Finally, the other criteria are that all the investing candidates; have to get a passing score in provincial points system. We at Opulentus, have a record of guiding many applicants, in this popular Investment Program.